Modular light towers combine a rugged frame with your choice of either a high quality generator or generator/welder. Each power unit delivers the features you’ve come to expect from Rain for Rent such as brushless design and excellent voltage regulation. Simple mounting requirements provide the ability to exchange power sources with minimal delay. 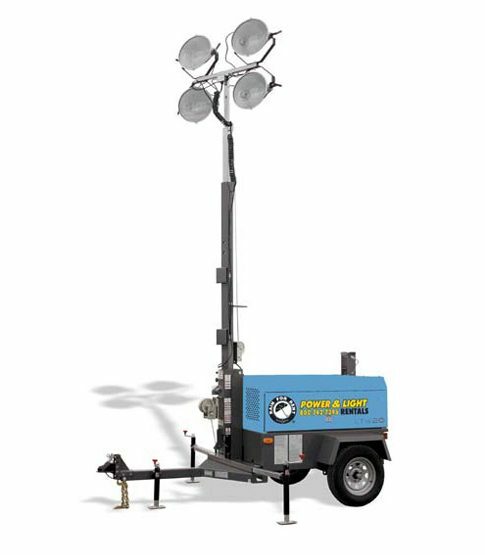 This unique design provides greater versatility than any other light tower on the market. Ballasts and light switches for the Light Tower Series are conveniently located in the tongue area of the trailer. Cold weather, wide body light tower. Fully Adjustable Metal Halide Lamps – Four 1,000 watt lamps provide maximum illumination and are controlled by individual circuit breakers for versatility. Lights can be removed and stored separately. Engine – Powered by a 15.4 Hp @ 1800 rpms, 1.123 L, 3 cylinder, Tier 4, Kubota D1105, naturally aspirated, liquid cooled, 4-cycle diesel with water separator fuel filter. Generator – Meccalte LT3 160/4, 10kVA, single phase, brushless capacitator excited, generator end with class H insulation. 60 Gallon Fuel Tank – Provides 94 hours of running time. Contents protected by a fluid containment system which holds 115% of all fluids on board. Drain plug at rear is included. Control Panel – Engine controller is sealed digital microprocessor with weather resistant membrane over buttons and LED indicators.Operation is via Simple One Touch, Start/Stop push buttons. Trailer Design – Withstands the rigors of the jobsite in addition to providing smooth highway towing. A 3500 lb torsion type, independent wheel suspension system for towing stability and low vibration.